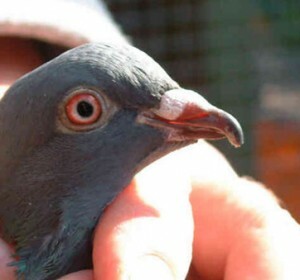 First, note that close study, in good light, of the beak of many pigeons will show a slight protrusion of the upper mandible, due to the natural shape of the individual’s beak. An abnormally downcurved beak occurs when the upper mandible grows considerably longer than the lower and assumes a downward, somewhat parrot-like curve. It can occur as a result of the upper and lower mandibles being out of alignment, due to a growth of canker and/or pigeon pox forcing the misalignment from within the beak area. 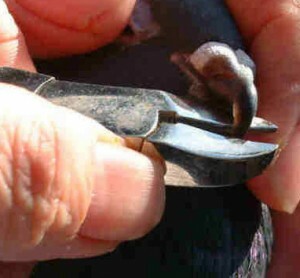 It is advised that the inside of the beak be checked immediately for such a condition on finding a bird with this problem. It sometimes seems to occur, however, with no obvious cause. Aside from treating any evident cause, as mentioned above, the upper mandible itself can be trimmed back. It may be best to have the initial trim performed by a vet, if one is not already familiar with birds, and observe carefully. 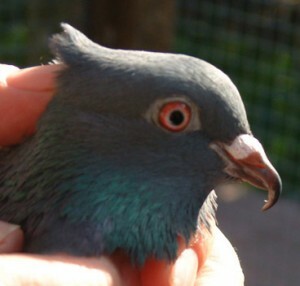 Some pigeons will need monitoring and regular beak trimming – others may rarely, if ever, require any further treatment. 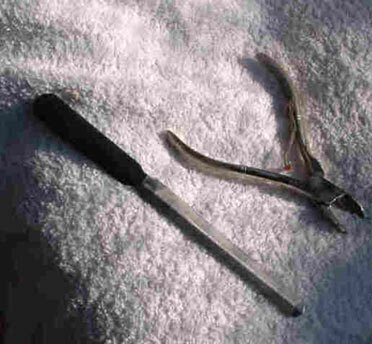 Recommended are small-bladed, sharp clippers for the actual trimming, and a small file for smoothing or for a minor trim (see picture). Only trim the translucent part of the beak, up to just before this part ends – that is, leave a section below the normal beak untrimmed. In some birds which have light coloured beaks (white pigeons for example) it may take very careful judgement to determine this. Trimming too far up can cause a bleed which can be a serious matter. The above pictures show trimming of a considerable overhang. In this case, it was felt that to trim further back could have proved dangerous to the pigeon.